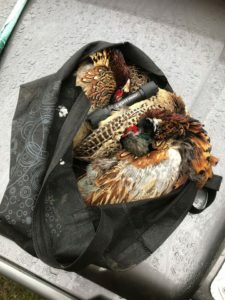 For example, on a beater’s day, attended by Countryside Alliance Campaigns Manager Jack Knott, a bag with three head-shot pheasants in, alongside a torch and some empty beer bottles, was found on private property near a pheasant pen. A quick investigation determined that the poaching had taken place less than 24 hours previously. The evidence was carefully collected up and the offence reported to the police. The rural crime team responded positively stating that poaching was a major issue in the area, and they will be round in due course to collect the evidence and, if possible, send it off for DNA testing. Whilst it will be difficult to catch the perpetrators and the crime is not necessarily top priority it is pleasing to see immediate action. In addition, the reporting of said crime allows Thames Valley Police to understand the actual level taking place, particularly in rural areas where crimes have historically gone under reported. Accurate records will allow the police to be effectively resourced and focused on catching every criminal. Help us to make our countryside a safer and more beautiful place to live in by reporting every crime.